I woke up this morning with tulips on my mind. I’m writing a YA novel and I had an idea that the protagonist should receive some flowers before the denouement. For some reason my mind settled on yellow tulips so then I had to crawl out of the bed and go look up the meaning of yellow tulips. Then I remembered it’s Good Friday and realized that tulips are a great thing to talk about today since they are also symbols of new birth and Easter. 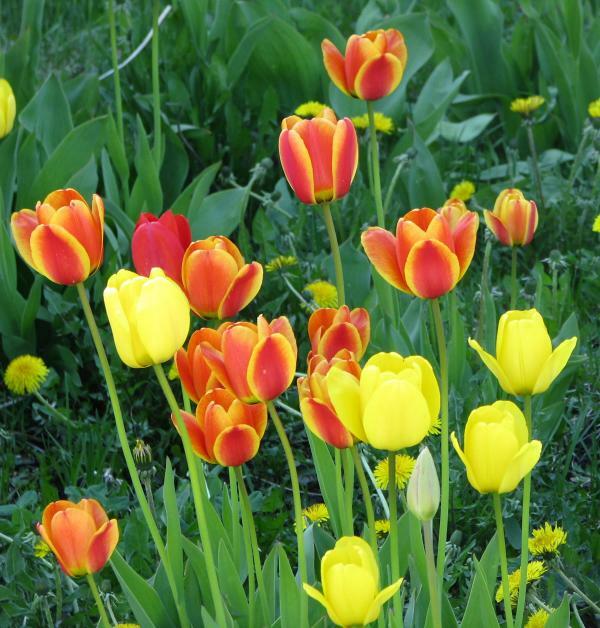 Tulips are originally from Turkey and Iran (bet you thought they originated in Holland, didn’t you?). They are still the national flower of both those countries. When the flowers were introduced to Europe, people called them tulips as they reminded them of the turbans worn by the Turks. Different colors of tulips have different meanings with the overall meaning being perfect love. Red means true love, purple means royalty, orange means happiness and white is for forgiveness and purity. The yellow meaning has evolved over the years to go from hopeless love to now meaning cheerful thoughts and sunshine. Both of these apply to my YA story so it’s cool that that’s the color and flower I woke with in my mind. I love how the brain works. Have a wonderful and blessed Easter weekend. It’s my #2 son’s birthday today and my #1 son is coming home so we’ll be having a fine feast. Each year, tulips are my proof that Spring is really here. Have a wonderful Easter weekend with your family, Jillian! Amen!! Thanks for the good wishes. Same back to you, Laurie. I’ve got some early tulips blooming in the yard and at least a little sunshine. Another winter in the books. Happy Easter, and Happy Birthday to your son! Yay, Liv!! Tulips are awesome. Thanks for the Easter and bDay wishes. Have a blessed one yourself! I love, love, tulips, too Lavada. And yep, kids bdays are more fun, aren’t they?